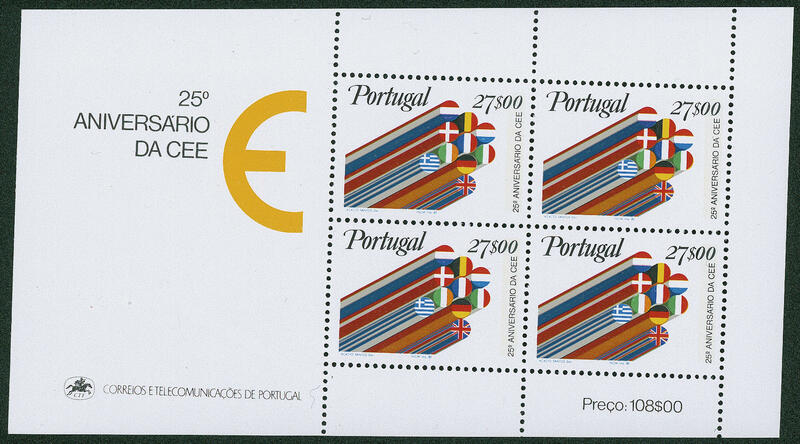 4021 Bl.34Abart European economic community souvenir sheet 1982 strong damaged in cutting, in perfect condition mint never hinged very distinctive and scarce variety! 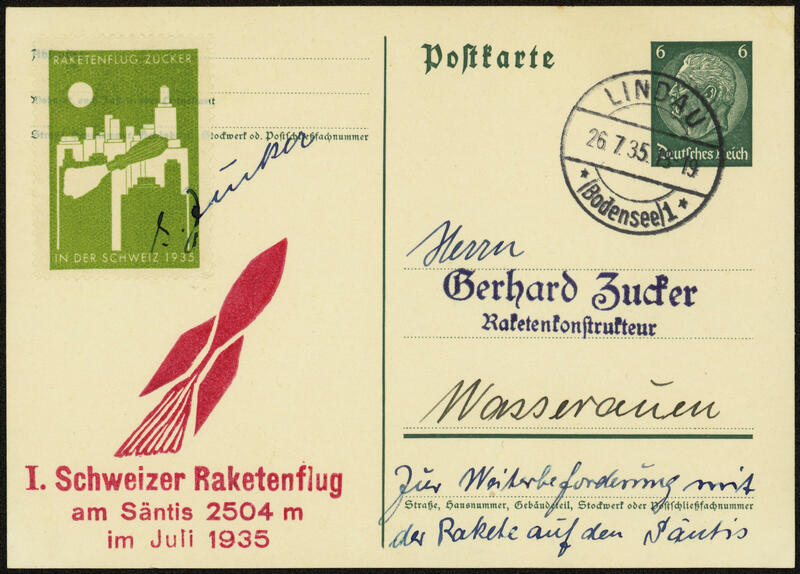 5040 ✉ 3C2 I. Swiss Rockets flight at the Säntis, very nice rocket post postal stationery German Reich 6 Pfg. With green rocket post vignette, red special confirmation stamp and signatur of Mister sugar, clear two ring cancel \"LINDAU 26.7.35\". It were only 150 cards transported! 4022 / 9IIxKb 6 Par. 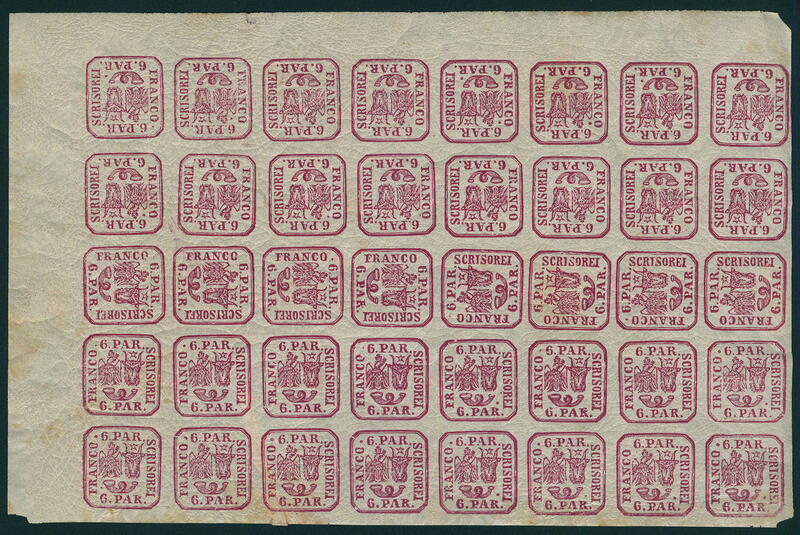 Red, plate printing, plain paper, complete sheet to 40 values, mainly mint never hinged, gum partly toned with the tête-bêches. As well two values with small little tear in margin. Another tear over three values at the bottom was already during of the Pressure with paper closed (the gum goes over repaired place). An interesting and extraordinary unit! 4023 14y 2 Par. Black on yellow, thin, colored paper, block of twelve from lower margin fresh colors and with wide margins, mint never hinged, the right vertical alignment with two stronger creases, otherwise negligible crease respectively gum creases. The unit point at the types of the reprint block in the follow 2-3 respectively 5-6 on. Rare! Photo expertize Dr. Gmach BPP. 4024 53 25 B. 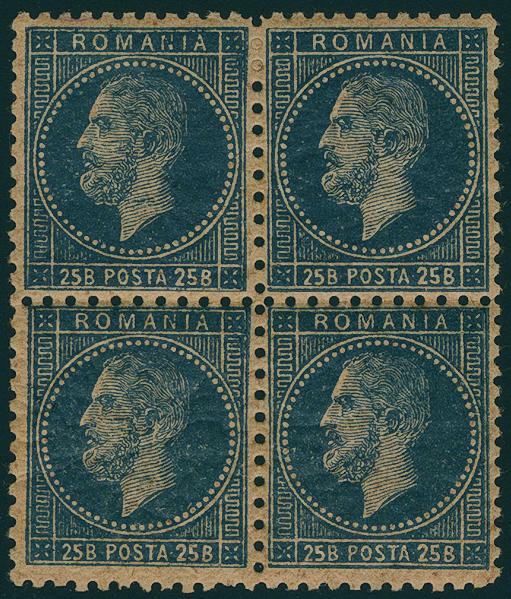 Blue on pale chrome-yellow, prince Karl I 1879, wonderful block of four, fresh colors, at the bottom a perf shortened, otherwise in perfect condition mint never hinged a scarce unit! 4025 1171/76 Popular sport 1948, all six values as miniature sheet, Michel no. 1173 fingerprint, otherwise in perfect condition mint never hinged Michel 400,- €. 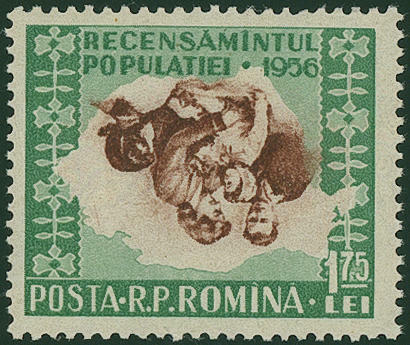 4026 1564K 1, 75 Lei census of population 1956 with inverted centerpiece, fresh colors and very well perforated, in perfect condition mint never hinged an extraordinarily scarce and attractive variety! 4027 ⊙ 3y 20 Kop. 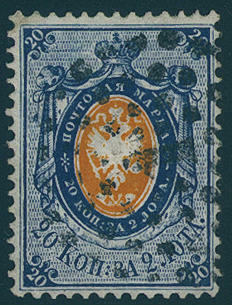 Dark blue / yellow orange, wonderful fresh colors and very well perforated with clean mounted number postmark \"1 (ST. PETERSBURG) \", thin paper. An outstanding quality this Russia rarity for high standards! 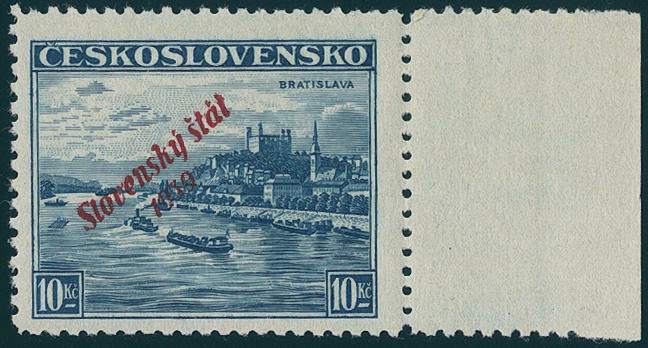 Photo expertize Mikulski \"perfect, stamps IN such beautiful quality come by of this issue rare before\". 4028 ⊙ 4x 30 K. Rose-carmine / dark yellowish green, thick paper, fresh colors and in perfect condition with natural perforation hole press-in in right lower middle, slightly and neat cancelled, photo expertize Matl. Michel 3000,- €. 4029 ⊙ 4y 30 Kop. 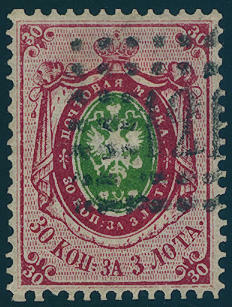 Rose-carmine / dark yellowish green, the scarce thin paper, wonderful fresh colors and very well perforated with clean mounted clear number postmark \"121 (TAGANROG) \". These rarity comes from the famous collection from Agathon Fabergé. An exception copy for the highest standards! Photo expertize \"perfect and very fine with neat cancellation\" Mikulski. 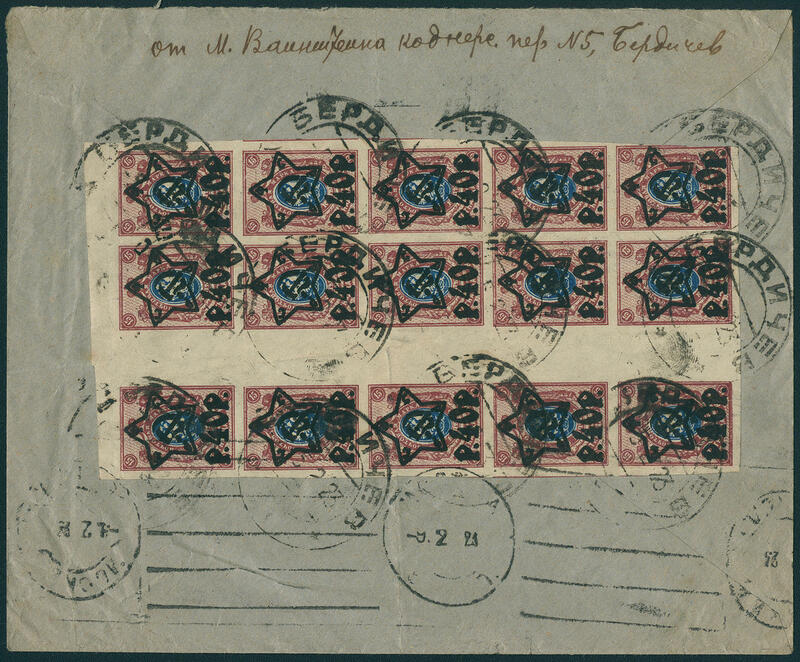 4030 ✉ 205BIc 40 R. On 15 K. Lively brownish carmine / blue, picture size 16, 3:22, 5 mm, cut, block of fifteen with gutters, commercially used, creasely, on interesting cover from \"BERDITSCHEW\" to Berlin. Rare in this form! 4031 MH6 Russian confederation 2001, the scarce stamp booklet with four stamp booklet panes, in perfect condition mint never hinged in perfect condition. Issued only 3000 piece! 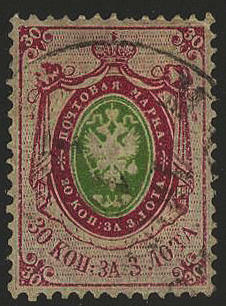 4032 ⊙ 976/80 300 years St. Petersburg 2002, all five values in the miniature sheet, fresh colors with perfect first day cancel`s. Michel 800,- €. 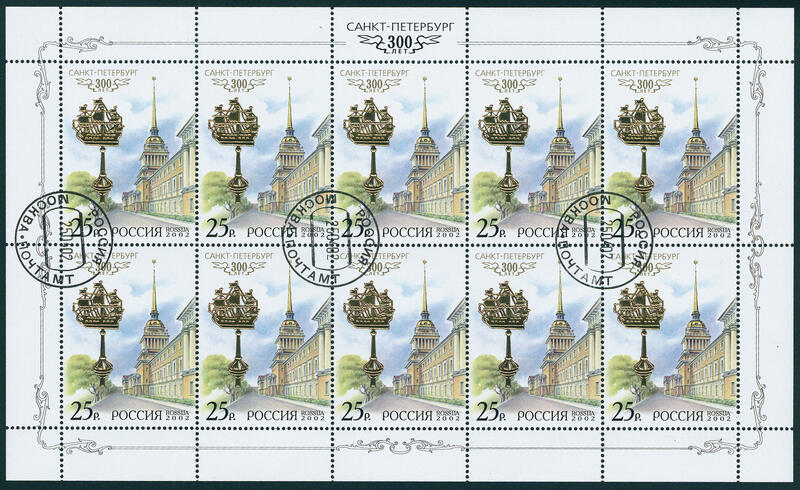 4033 ⊙ 976/80 300 years St. Petersburg 2002, sheetlet series to 10 values, unfolded with perfect first day cancel`s \"Moscow 25.4.02. \". Michel 800,- €. 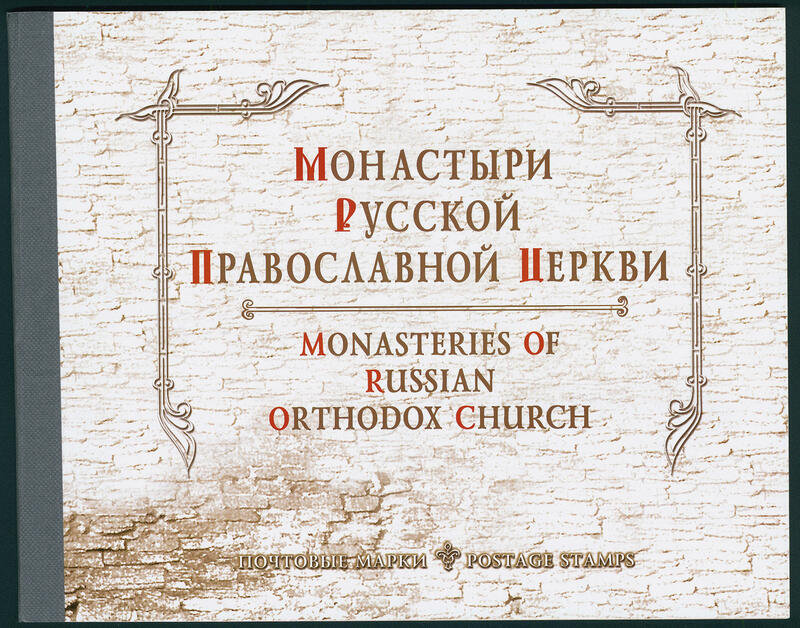 4034 MH12 Monasteries 2003, the scarce stamp booklet in perfect condition mint never hinged, issued only 3000 piece! 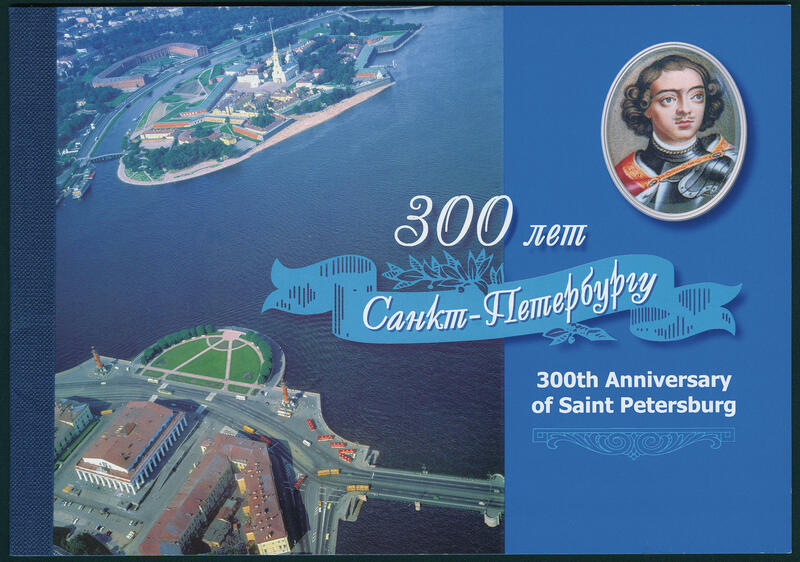 4035 MH13 300 years St. Petersburg 2003, stamp booklet in perfect condition, in perfect condition mint never hinged issued only 3000 piece! 4036 ✉ 36,40,46 3 C. On 3 K., 10 C. On 10 K. And 50 C. On 50 K. As wonderful three colours franking on very nice complete package address for five books and one periodical from \"TIENTSIN 10. APRIL. 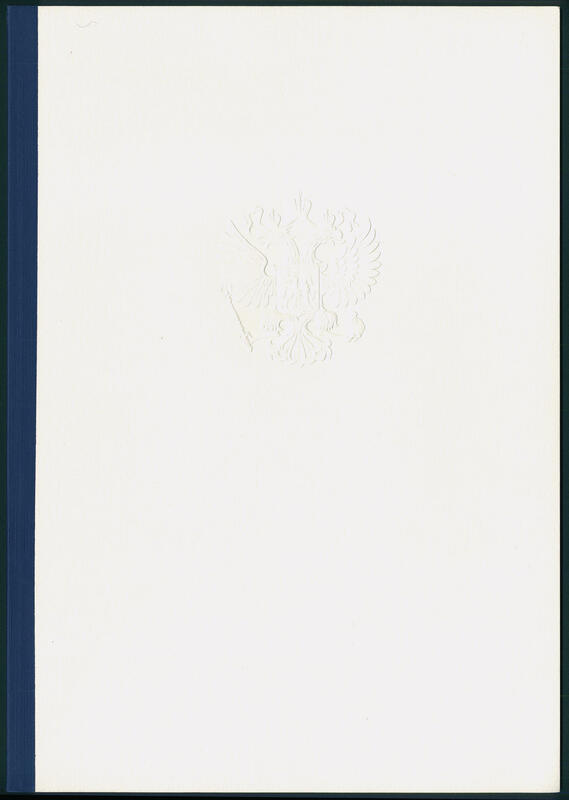 1918\" to the Swedish red cross in Khabarovsk / Siberia with red impression \"HÜLFSAKTION library TIENTSIN MARGARETHE SCHELL\". 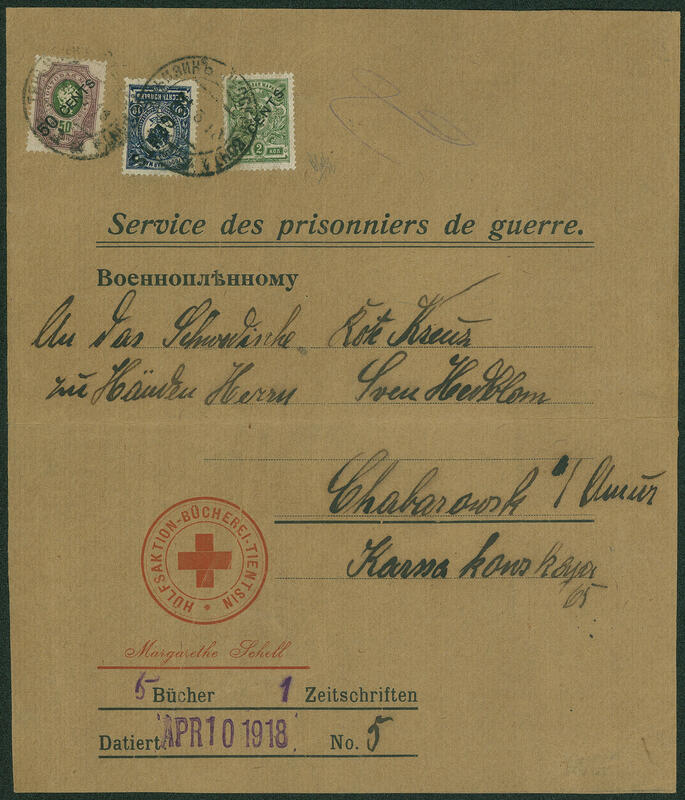 A wonderful and extremely rare document of the Red Cross in the Services the prisoner of war. Photo expertize Mikulski. 4047 192/97ZW Zeppelin series 1933, all six values in vertical gutter pairs, unfolded, cheap 3 L. A little oxidated, otherwise wonderful fresh colors and in perfect condition mint never hinged in this kind very rare! 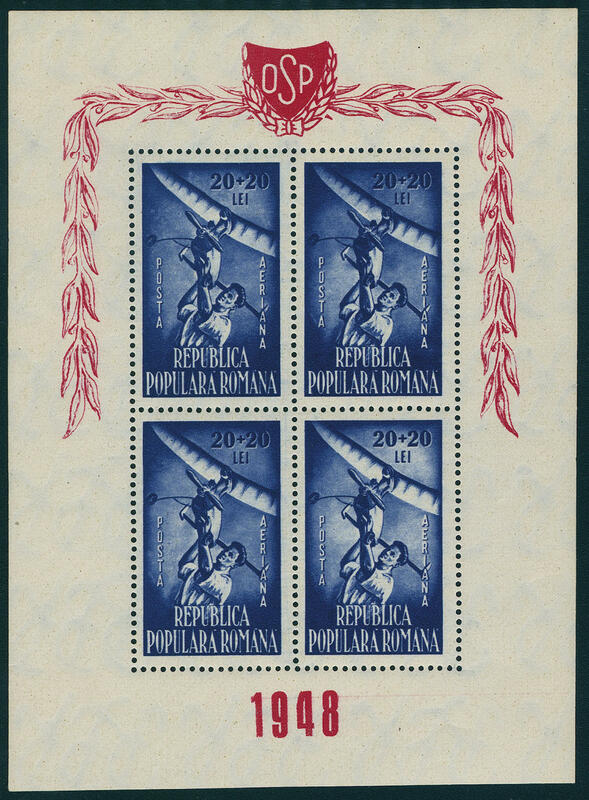 4235 Feb 22 Postage stamps set 1939, fresh colors and in perfect condition mint never hinged Michel 550,- €. 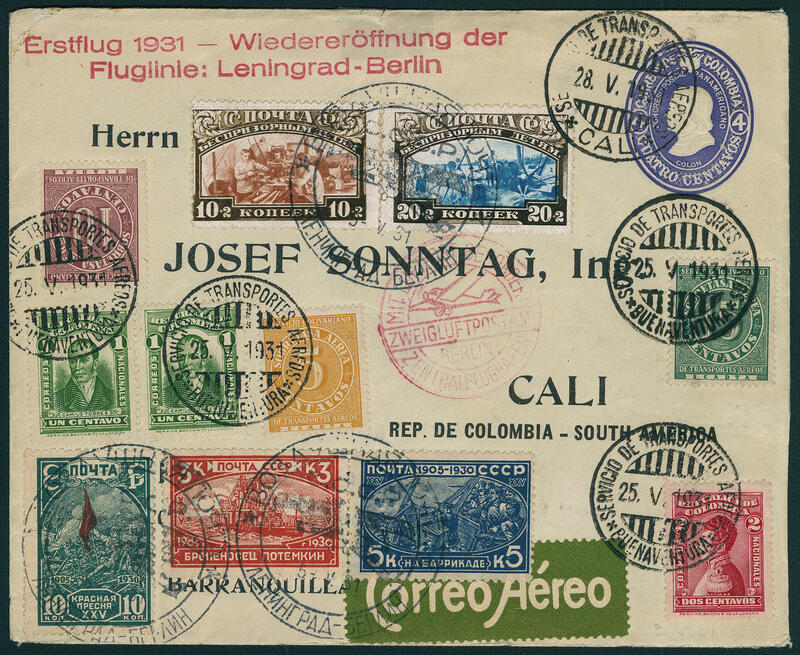 4037 ✉ 361/62,394/96 Reopening the Airline Leningrad-Berlin, a very nice first flight letter with wonderful franking Soviet Union / Colombia / Scadta to Cali / Colombia with all cancellations including transit and arrival postmarks front- and reverse. Very decorative!